BEIJING (AP) — Global stocks rose Tuesday after U.S. lawmakers reached a deal to avoid another government shutdown and ahead of U.S.-China trade talks later in the week. In Europe, London’s FTSE 100 rose 0.3 percent to 7,148 and Germany’s DAX gained 1.2 percent to 11,144, while France’s CAC 40 advanced 1.1 percent to 5,070. On Wall Street, futures for the Dow Jones Industrial Average and the Standard & Poor’s 500 index were up 0.9 percent and 0.7 percent. Market sentiment seems to have been bolstered somewhat by the deal reached in principle late Monday to avoid another bruising shutdown of the U.S. government. Details are set to be officially released Tuesday, but the Trump administration reportedly settled for a lower amount of funding for a barrier with Mexico in order to strike a deal. The deal also reduces some uncertainty for investors as they focus on the trade war between the U.S. and China. U.S. Treasury Secretary Stephen Mnuchin will lead a delegation to Beijing on Thursday to discuss American complaints about China’s ambitions in the technology sector. “Investor sentiment remains cautious despite reports suggesting that President (Donald) Trump’s advisers are discussing a potential summit with his Chinese counterpart Xi Jinping next month,” Zhu Haini of Mizuho Bank said in a commentary. ASIA’S DAY: Tokyo’s Nikkei 225 rose 2.6 percent to 20,864.21 and the Shanghai Composite Exchange added 0.7 percent to 2,671.89. 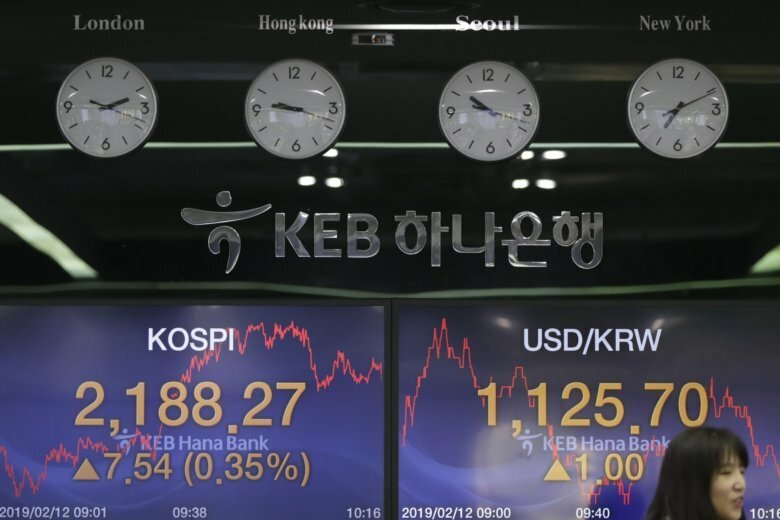 Hong Kong’s Hang Seng was 0.1 percent higher at 28,171.33 and Seoul’s Kospi gained 0.4 percent to 2,190.47. Sydney’s S&P-ASX 200 advanced 0.3 percent to 6,079.10 and India’s Sensex lost 0.2 percent to 36,303.11. New Zealand, Taiwan and Thailand rose while Singapore declined. ENERGY: Benchmark U.S. crude gained $1.05 to $53.46 per barrel in electronic trading on the New York Mercantile Exchange. The contract lost 31 cents on Monday. Brent crude, used to price international oils, rose by $1.36 to $62.87 in London. It shed 59 cents the previous session. CURRENCY: The dollar gained to 110.50 yen from Monday’s 110.36 yen. The euro edged up to $1.1285 from $1.1279.